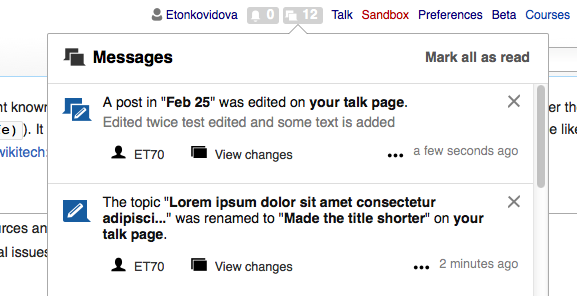 Right now, when something happens on your user talk page, and your user talk page is wikitext, you get an edit-user-talk notification, which is an alert and clearly states your user talk page has been changed. 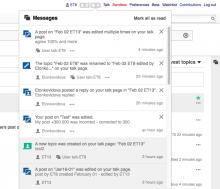 However, if your user talk page is a Flow board, you get a generic Flow notification (not classified as an alert), with no special indication that your user talk page is involved (other than the page name near the end of the message). We should prioritize Flow notifications about the user's own talk page, probably by creating a new notification type for them. Which events should we do this for? flow-topic-renamed: Probably not? If someone renames a topic you created, I don't think it matters much where that topic is located, and people don't frequently create topics on their own user talk page. flow-post-edited: Probably not? If someone edits a post you wrote, I don't think it matters much where that post is locate,) but I'm less sure in this case. flow-mention: No. A mention is already an alert, and there will already be separate event about someone posting on your user talk page anyway. Should we always notify for events to do with your user talk page, even though you otherwise wouldn't be? For new topics: yes. I think we should notify the user about new topics on their own user talk page, even if they don't watch that page. For posts: maybe? I think it would be consistent with edit-user-talk to notify about all posts regardless of whether the user watches the topics those posts are in; but we'd probably need good bundling to prevent this from getting too spammy. For edit-user-talk, this is fine because the events are all bundled together and you end up with something like "Alice and 2 others edited your user talk page" even if those three people made a hundred edits. Catrope assigned this task to jmatazzoni. Catrope added subscribers: Catrope, Trizek-WMF, Pginer-WMF, Quiddity. Assigned to Joe to narrow down the specifics and come up with wording. Re: flow-post-edited - currently these are only sent when someone edits my post. If a topic is on my user talk page, I'd want to know when anyone edited anyone's posts (whether it's their own, or someone else's). 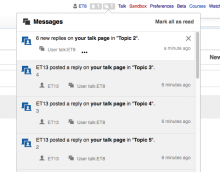 Re: flow-topic-renamed - similarly, if something happens on my user talk page, I want to know about it, as a higher priority, because it could be people engaging in an edit-war. This is related to the more long-term discussions about flow 'noise/volume' controls: T121138: Enable a way for us to choose whether to autowatchlist each new flow topic and T100528: Improve organization and control for Flow notifications (tracking + ideas) - I.e. On some topics (or boards) I want to see everything that changes. The most complicated/unresolved aspect of this is: Do I want to get Notifications for every single change, or just to have every single change appear in my watchlist? I am now tempted to rename this task to "Engage full surveillance mode for Flow talk pages"
I use Flow on my volunteer talk page since July, and, when I have 5 notifications from Flow, I really appreciate to know the priority. A direct message to me is #1 prority. flow-topic-renamed: Yes: some people may, as they are upset by something you have done, change topic titles. Already experienced. flow-post-edited: If there is already a warning about your posts edition, no matter where it is posted, that's fine. But +1 on the fact that people edit other posts than mine on my talk page (due to the same experience as above). any activity on your talk page should be notified, no matter if you want it or not. I've spread the word on cawp, frwp and zhwp. The "you have a new message" notification has been always there for at least one decade, it has been useful and we would miss it. Furthermore, I get about a dozen notifications a day and I would easily miss messages in my talk page. Then, an special notification for editions in the user's own talk page is a must. For me, not having it a reason strong enough not to migrate my talk page to flow. I don't know which way we want to go on this, but this is indeed a good time to discuss this (newtalk flag, new mini-orange bar and how it should relate to Flow given that we're making this change). To address the concerns raised in this ticket, we propose a new category of Flow notification that is specific to flow user talk pages. Some of us have been commenting on a Google doc of a proposed spec for this new notification type, and it should be pretty close to finalized so I'm now copying the contents of that doc to this ticket, below. Please use this version going forward. Definition: To address the concerns raised in this ticket, we propose a new category of Flow notification that is specific to flow user talk pages. Name: we propose the name “flowusertalk” for this new category. Urgency: Because the user talk page is important, all of these types will be Urgent in our new scheme (under development T123018) and will be signaled as such. Mention: we don't need a new item for flowusertalk-mention. 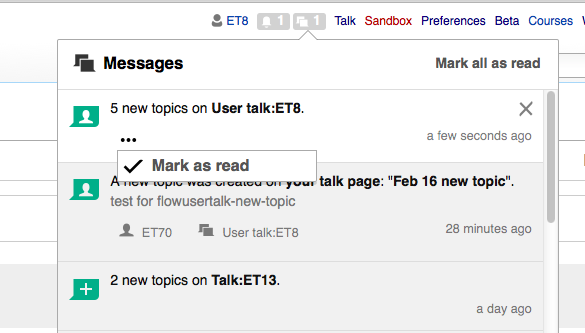 As now happens on wiki user talk pages, if someone mentions you on your flowusertalk page, the other notification types supersede (and no redundant notification will be sent). Icons: Since these enlarge the existing class, as it were, of talk page notifications, their icons share “family” characteristics with edit-user-talk and should be distinct from the (new) icons used for the four non-flowusertalk notification types these new types are based on. E.g., the icon for flowusertalk-new-topic will be distinct from flow-new-topic and will bear a family resemblance to edit-user-talk. 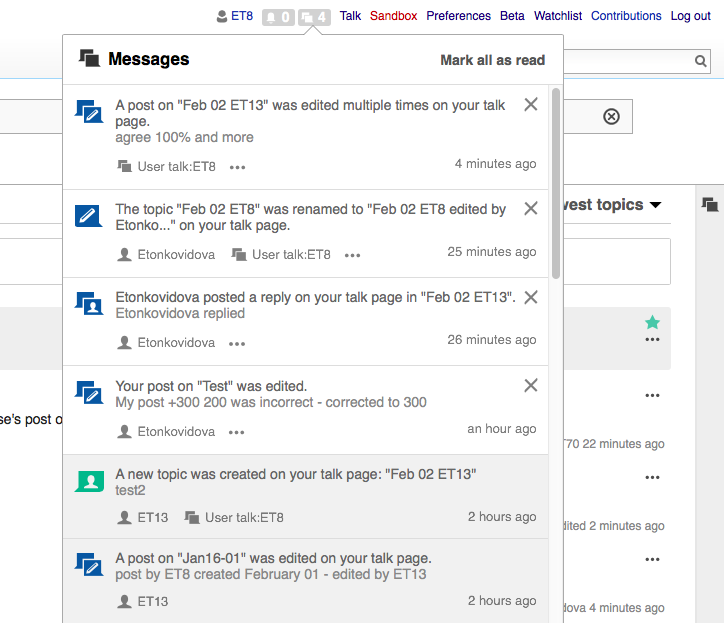 flowusertalk-post-edited Unlike flow-post-edited, which notifies you only when a post YOU made is edited, the flowusertalk version will notify you when ANY post on your user talk page is edited. For the record, regarding use of the Orange Bar for flowusertalk Notifications: In the 12/29 Collab Team Discussion meeting, we decided that the Orange bar will not appear initially for flowusertalk notifications. We think this is somewhat redundant given the urgency scheme. But Nick points out that the users have strong feelings about the bar. We will initially leave the Orange Bar in place for edit-user-talk. Ultimately, however, both kinds of user talk (Flow, non-Flow) notifications should get consistent behavior. If the users complain about the missing bar, we can add it for flowusertalk. If the users don't complain, we can revisit the bar's usage for for regular user-talk (needs community consultation). jmatazzoni moved this task from Product/design work to Ready for pickup on the Collaboration-Team-Archive-2015-2016 board. Where can I find the icons? Barring the icons (which are currently the default Flow non-talkpage equivalents), this patch is ready. I'm sorry, but I'm not following this. Can you explain more fully? And do you need me to change the spec here? I was just pointing out that the mention notification being superseeded by a more important notification for the same event appears to be broken for flow-new-topic. It is broken because 2 notifications are sent for the same event. I filed a ticket for it so it can be discuss and fixed. No action needed here. For consideration, T125117: Should get notified for board description change on your own user talk and T125119: Should get notified for topic summary change on your own user talk. I tested watched (default) and non-watched Flow talk user pages - no difference in notifications type/rate. Language Point -- "in" vs. "on"
Etonkovidova posted a reply on your talk page in "Feb 02 ET13"
Your post on "Test" was edited. 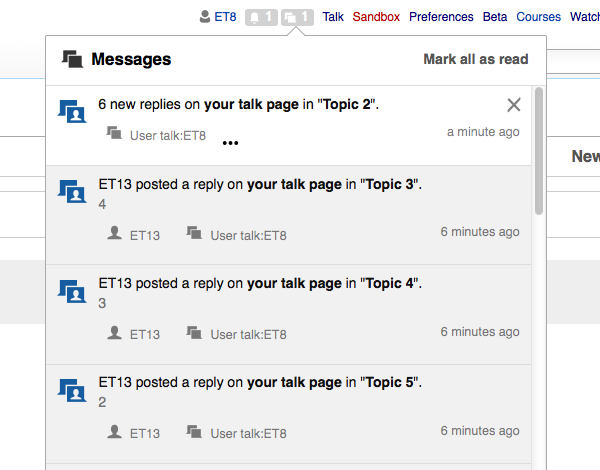 The first message (correctly, IMHO) talks about a reply that was "on" your talk page and "in" a certain topic. But the second, if I read it correctly, talks about a post "on" a certain topic. But things should be "in" topics. The language on the Notifications spreadsheet is mostly consistent on this point. Does this make sense to people? When talking about a topic, I propose we standardize on saying that posts or edits are "in" the topic. Makes sense to me. I adjusted M132 accordingly since one of the examples was not following that. A topic title is bolded. Topics should be bolded. The spreadsheet is corrected. Excerpt of message (if feasible) -- for multiple topics on a page is not implemented. OK as it is. V 2.0 Notifications -- Showing Updated Text and Links OK as it is. Other specs are in place - see the screenshot and specs description below. Body text: Excerpt of the topmost visually of the new posts (if feasible) --not implemented? OK as it is. Other specs are in place - see the screenshots and specs description below. Secondary link #2	--- not yet implemented ? - Needs to be implemented. Secondary link #2	--- not yet implemented ? Needs to be implemented. Header text: A post in “Rapa Nui” was edited on your talk page. Elena and I went through her notes above, and she is going to carry forward required changes below. Checked against specs in V 2.0 Notifications -- Showing Updated Text and Links - all specs are in place.